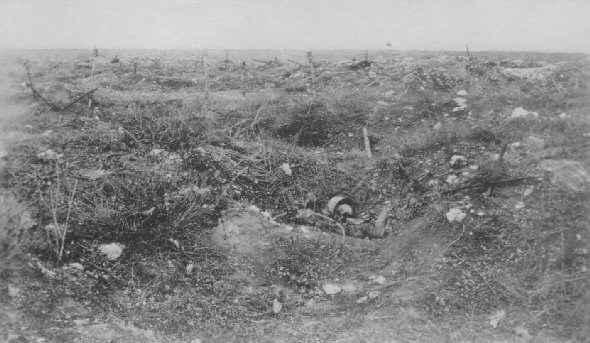 From Hill 304 showing the ground which men of the Reclamation and Demolition Office go over, salvaging ammunition and exploding duds. Six thousand sq. m. of France, equivalent to a strip two miles wide stretching from New York to San Francisco, was a wilderness. This area had housed 2,000,000 people, 5 per cent of France's population. With band blaring and colors flying, the 90th Div. 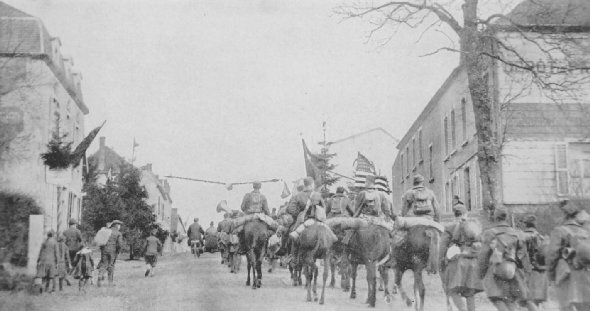 (Texas and Okla.) crosses the Belgian-Luxembourg border and marches through Aubenge. Townspeople gave an enthusiastic welcome, and streets were gay with Belgian and American flags.